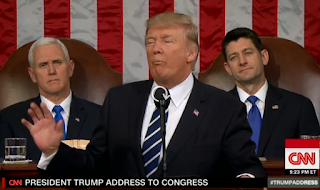 I watched US President Donald Trump's Joint Address in the US Congress today. There were lots of applause and frequent standing ovations, mostly from the Republican legislators. I know that many people, many friends included, hate this leader but he seems to deliver powerful messages that get through the hearts of many Americans. He is stoking American nationalism to a high level. Whether this implies trade protectionism or not is a matter of debate, but he seems to be effectively stoking that #Americanspirit. Am not American nor do I live in the US so I cannot fathom these things well. On the “rise once again of ultra-nationalism”, I think Obama did the same, stoke American nationalism with the slogan "Hope and change" for 8 years. But the unconventional style and messages of Trump seem to show that Obama failed to sustain his nationalism call with the voters. 1. He wants more government in defense and military, immigration and border control, rule of law. 2. He wants less government in healthcare (repeal and replace Obamacare), in regulations, bureaucracies and taxes. 3. Mix message in trade: less or zero export taxes but more bilateral engagement in trade. "And we've spent trillions of dollars overseas, while our infrastructure at home has so badly crumbled.... Our military will be given the resources its brave warriors so richly deserve. Crumbling infrastructure will be replaced with new roads, bridges, tunnels, airports and railways..."
Being an advocate of less/minimal government, for me these pronouncements are good. Former President Ronald Reagan's ideals are somewhat revived? "We have placed a hiring freeze on non-military and non-essential Federal workers. our slow and burdensome approval process at the Food and Drug Administration keeps too many advances, like the one that saved Megan's life, from reaching those in need. If we slash the restraints, not just at the FDA but across our Government, then we will be blessed with far more miracles like Megan." "Trump's economic nationalism (especially as it takes the form of tariffs and bullying companies about where they want to locate) is a big problem but he gave the best speech of his political career tonight. Certainly there were things a liberty lover should take issue with but I hope the good things he talked about are given praise, attention and encouragement. Deregulation. Hiring freeze. Getting rid of Obamacare. Gorsuch, etc." "damn fine speech. the best part about it is the litany of failures that the progressive policies wrought and seeing the democrats' reaction as it was being read to them. a boffo performance by a man just a month into his presidency." Jemy added that he's far from being a Trump fan but he gives credit when it's due. Meanwhile, here are US stock market performance over the past 6 months ending yesterday. Business optimism is sustained by Trump? Charts from WSJ Markets. Am not really a fan of Trump but I like many of his policies -- on energy, deregulation, debureaucratism, tax cut, etc.